There are only a handful of machines that can give you as much as the Fitness Reality E5500XL within the price range. For an elliptical machine under the $300 mark, the Fitness Reality E5500XL can be considered as one of the best contenders in the market for your home gym. This highly customizable and reliable unit comes packed with features that can easily give its competitors a good run for their money. The various magnetic resistance levels accompanied by a library of pre-installed workouts give users the ability to choose how challenging their workouts should be. If you are ready to trade off inclining options for overall stability and quality, this might be the perfect addition to your fitness arsenal. High-quality components and lots of features at a very low price. 24 levels of magnetic resistance with easy adjustments through the console. A dual transmission system that helps retain momentum during workouts. Fluid stride motion and quiet operations. No incline options – but might be a fair tradeoff for the price. Only a 1-year limited manufacturer warranty. 24 levels of magnetic resistance. Motorized Eddy Current magnetic resistance technology. Dual-transmission system that runs two flywheels to sustain momentum. Goals system based on distance, time or calories burnt. Weight capacity of 270 lbs. Dual handlebars with heart rate monitor on stationary handles. There is little to complain about with the Fitness Reality E5500XL – it delivers as promised. The stride action is smooth, operates in silence and facilitates effective workouts. The resistance levels can certainly get the muscles moving, and the transmission system helps you maintain your motion well. The console functions are responsive to change, with accurate user status readings. Overall, it hits the sweet spot considering the price paid. The only thing worth mentioning is to ensure proper lubrications and that all the nuts and bolts are tightly in place to avoid any squeaking or clicking noises. For a budget equipment, the build quality on this unit is exceptional. With the stabilizers on the legs, there are no wobbling issues. The frames and components used on the machine are very sturdy and do not look cheap at all. The overall design is very ergonomic as well for users who are around 6 feet tall, even with the 18″ stride length. 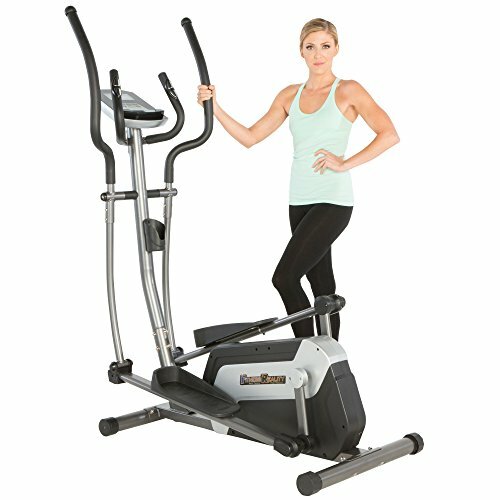 Fitness Reality proved that high quality does not alway come with an outrageous price with this budget machine! Assembly is relatively straightforward on this one. If you’ve put an elliptical together before, it should not take more than an hour. If you are new to this, might take up to 2 hours without a helping hand. The assembly instructions are clear on the manual provided. Follow through step-by-step, and there should not be any need to reassemble anything. Ensure that the moving parts are well lubricated where required and all the bolts are set in tightly to avoid any noise during operation. As an elliptical machine that is highly rated by buyers and considered to be one of the best budget models out there, we can firmly stand by it. There are only a handful of machines that can give you as much as the Fitness Reality E5500XL within the price range. The array of features provided and the motorized magnetic resistance flywheel accompanied by a sturdy build quality has most users leaving positive reviews about this machine. Overall a great piece of home equipment for starters and enthusiasts alike! I brought this elliptical a few years ago. I accidentally broke the adaptor and tried ordering from the website provided in the manual as well as from amazon. It has the same model as the original adaptor, but still does not fit the plug in of the machine. Where can I get a replacement adaptor that fits?